Before we finally start moving into news, reviews and whatnot, I feel like there’s one last thing we should cover in a bit of detail; your Local Game Store. Basically, if you’re looking to do everything from pick-up the latest release for your favorite new game, get some serious play time in, or just want to meet like-minded gamers, your LGS is going to be the place to be. The best game stores are as much a social hub as they are a retail establishment. 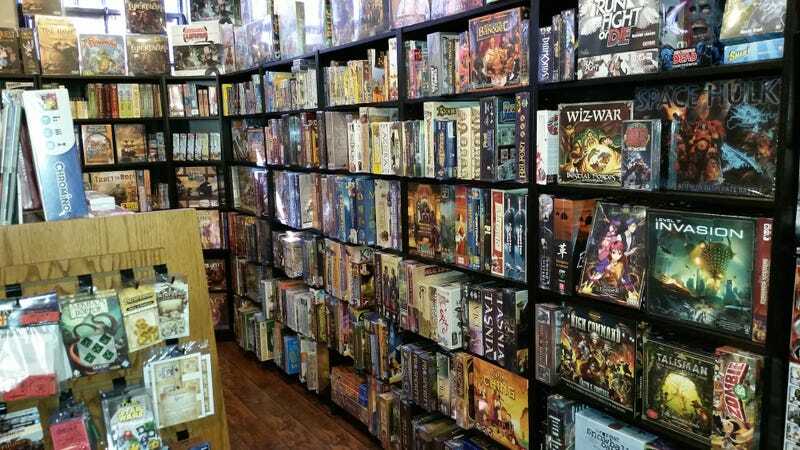 They’re generally also the only place you can pick up most hobby games, since most ‘big-box’ chain stores will only have a fraction of a fraction of the games,inventory, or selection you could be playing. Of course there are online retailers, and while they are convenient they simply don’t provide the space and social experience a good LGS can provide. For me the biggest boon that a LGS brings is the competition, serious or casual. Its a place to sit down and play whatever game I’m currently in love with. Most LGSs will have space, a couple of tables and chairs where you can sit down and enjoy yourself. Generally speaking stores will also usually have some form of organized play, official or otherwise. D&D Adventure League and Friday Night Magic are two specific examples of organized play directly supported by the company. Most companies will generally have some form of participation or prize reward for local game stores to hand out. These usually will consist of alternate art game pieces, special boxes, or even playmats. Miniatures games will have campaigns, an evolving set of matches played over several weeks that are a little more free form than playing out an entire tournament in one day or evening. All-in-all its certainly nice to get some play time in with your favorite game and occasionally be rewarded for it. If you’re unfortunate enough to not have any local game stores, or any that have space to play, but really want to try to get in on that social play, my suggestion would be to hunt out facebook groups, google groups, and online software that will allow you to play over the net. Similarly if there are no local play groups for your game, don’t lose heart! It may take some work on your part, but with the help of the store owner or manager hopefully you can work on getting the word out for a playgroup for your game. Also, be sure to frequent your game’s website and forums. There might be a local play group advertising or looking to start! If you have a favorite LGS, let me know in the comments below. If you’re without a group, perhaps you can find some like-minded gamers in the comments too!